The Manchester Reserves Experience - what's that all about? On Thursday 15 October, at the historic Manchester Town Hall, civil servants from across the North West will get an insight into the Reserve Forces – who they are, what they do and how the training, skills and experience gained in the Reserves can be put to good use back in the day job. Your Reserves Experience will start with a briefing on a fictional but highly plausible operational scenario. You’ll have the opportunity to spend time at four interactive stands demonstrating some of the capabilities – such as force protection, medical, intelligence, communications, engineering and logistics – that Reservists might be expected to support on this type of operation. You’ll be able to talk to Reservists from all three services – the Royal Navy, the Army and the Royal Air Force – about the sorts of challenges they are likely to confront and the hi-tech equipment they use on operations. And you’ll even get to try out some of the equipment. 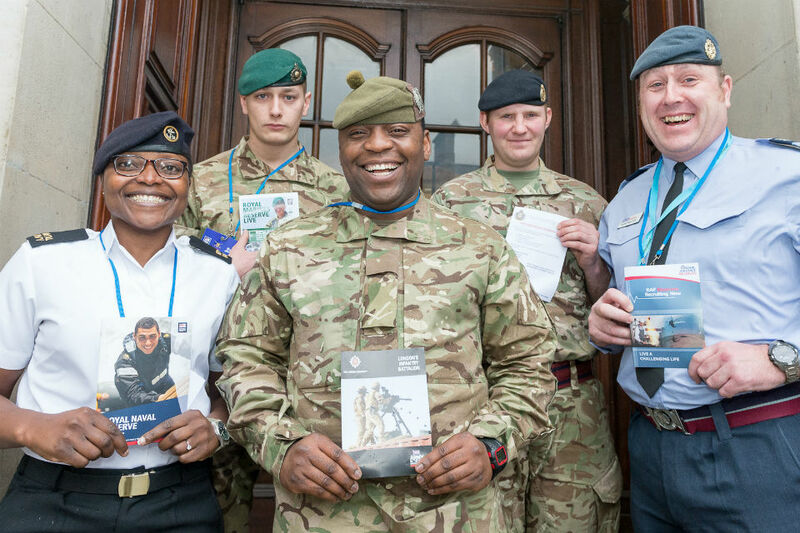 You’ll also hear first-hand from civil servants what it’s really like to be a Reservist, what the benefits are and how they balance Reserve service with their Civil Service job and other commitments. For example, you may not know that your department gives Reservists a minimum of 10 days annual special paid leave for training – and many departments offer a minimum of 15 days. I had no prior knowledge of the Reserves before the event so I felt the whole day, every aspect of it, was very helpful and interesting. As a line manager, I now understand how I can support those taking on the role of a Reservist. The enthusiasm and dedication of the Reservists came through strongly. They were all clear about what Reserve service had done for them. I was struck by the obvious pride and passion they had for the job they carry out in the Reserves. Too old and medically unfit for this to benifit myself , however i would encourage all who can to do so . The skill sets you learn and use will be a benifit ...training , social life and fun as well .. hey and being paid for it all . In this day a transferable skill set will help us all as we prepare to moove around departments or work areas .